Dispersed farms along turnpike road, in landscape of irregular, medium-sized hedged fields with scattered larger oaks, ponds and some ridge and furrow, superimposed by disused railway. The landscape area forms part of the medieval ecclesiastical parish of Henllan, to the north of the town of Denbigh. It falls along the eastern edge of the medieval commote of Is Aled, in the ancient cantref of Rhufoniog. Fairly flat and well-drained land above the valley floor, between about 25-55m OD, dropping down to the banks of the Afon Clwyd to the east of Pontruffydd Farm. Dispersed, post-medieval farms up to about 800m apart characteristically sited alongside the turnpike road between Denbigh and Bodfari, with fine ranges of 18th-century brick outbuildings at Pontruffydd Farm and Ty-mawr. 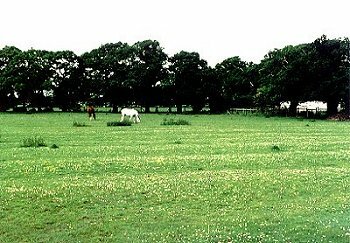 Landscape of irregular, medium-sized fields, predominantly down to pasture, with slight field banks and generally low-cut hawthorn hedges, some formlerly laid. Numerous scattered mature oaks, the lines of trees in some fields indicating former field boundaries. Some areas of ridge and furrow of uncertain date, as in the case of a number of adjacent fields around Penpalmant farm. Small scattered ponds of uncertain date and origin, set within fields or along field boundaries, some of which have recently been filled in. A number of farms, like Penpalmant, are sited alongside the turnpike road between Denbigh and Bodfari - Penpalmant (Welsh, 'top/end of the pavement') seemingly being named after the surfaced road north of Denbigh. In a similar way, Pontruffydd Farm, to the north-east, is named after the important bridge crossing the Afon Clwyd to the north of Lleweni. There is a further stone road bridge at Pond Ffriddmor, across the Nant Lleweni between Penpalmant and Pontruffydd. The northern and western sides of the character area are defined by the embankment and cuttings for the Mold & Denbigh Junction Railway, in operation between 1869-1968 (Baughan 1991, 76-9), with stone bridge abutments surviving to the south of Ty-mawr farm and fine stone bridges across the Afon Clwyd to the east of Pontryffydd Farm. The high railway embankment to the north of Pontfryffydd Farm now a small but prominent deciduous woodland plantation.